Fawn’s mother was confined and chained in a milking stall where she couldn’t turn around or lie down. She was forced to give birth to Fawn standing up. 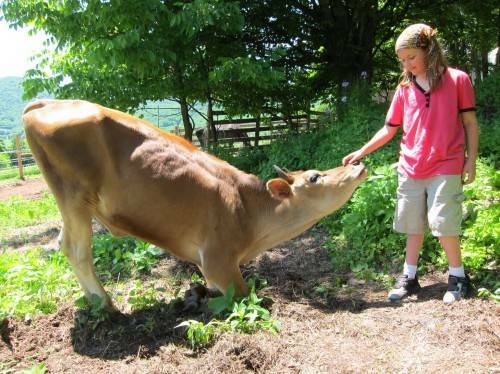 In the process, Fawn fell into the concrete manure pit behind the row of cows. This tiny calf hit her face and front knee hard. Fawn’s mother was confined and chained in a milking stall where she couldn’t turn around or lie down. She was forced to give birth to Fawn standing up. 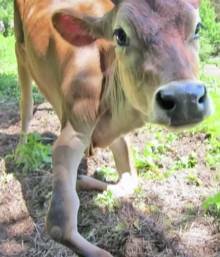 In the process, Fawn fell into the concrete manure pit behind the row of cows. This tiny calf hit her face and front knee hard. I can’t imagine how incredibly anxious and desperate this mother must have been, unable to reach her newborn baby. 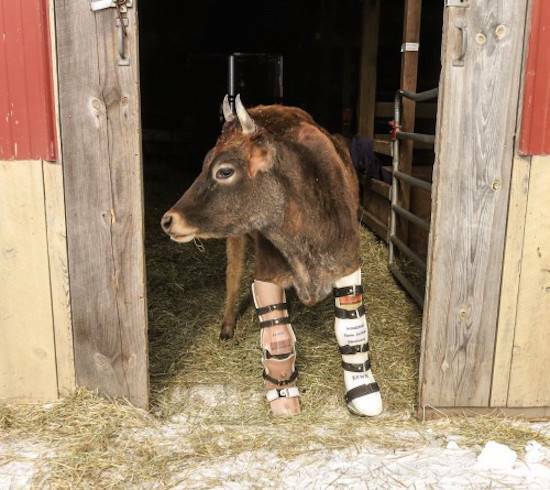 The farm’s manager discovered Fawn swollen and injured in the pit, and decided to call a local woman named Jennifer who had expressed interest in raising a “pet cow.” He told her that the calf probably wouldn’t make it, but that Jennifer could have her. Jennifer kept Fawn inside the house, wrapped her in blankets, and bottle-fed her. But because the veterinarian didn’t correctly diagnose and treat Fawn’s fractured, infected knee, it didn’t fully heal. Despite Jennifer’s love and attention over the next year, Fawn’s “good” front leg could not support her increasing weight and unable to stand up properly, Fawn started hobbling around on her front knees. At that point the vet told a heartbroken Jennifer that it was hopeless, that Fawn would never walk again. He recommended having a neighbor come to shoot the calf. That’s when we met Fawn. 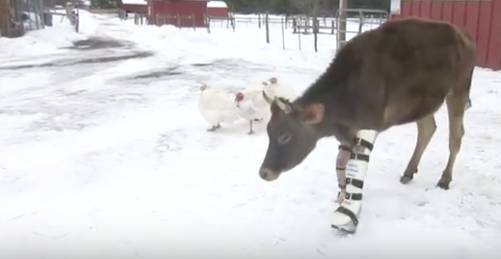 Jennifer was desperate to give her one more chance and reached out to Woodstock Sanctuary for help. We soon learned first-hand how sweet and affectionate Fawn was and understood why Jennifer loved her so much. We had the equipment and resources to get Fawn to the experts at Cornell Veterinary Hospital, but after watching her shuffle around on her knees, legs horribly twisted, we fully expected the vets would tell us that the kindest thing to do would be to euthanize her. The situation looked beyond hope.